Ford has launched the 2018 Aspire facelift in India at Rs 5.55 lakh (ex-showroom pan-India). 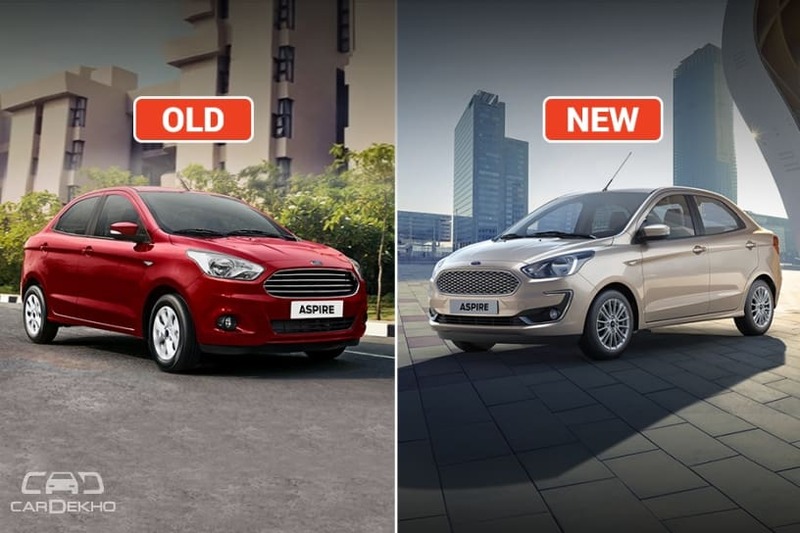 To set it apart from the outgoing model, Ford has given the Aspire facelift some cosmetic updates along with some mechanical ones. What are they? Read on to find out. As the increment is marginal, the cabin space of the new Aspire should be identical to that of the pre-facelift model. The Aspire facelift looks largely similar to the outgoing model save for some revisions. It gets a Freestyle-like front bumper, albeit with chrome inserts. The front grille is also new and features a mesh pattern instead of the horizontal chrome slats in the outgoing model. At the back, the only visible change is in the form of new air vents in the bumper. The boot lid continues to get a chrome applique just like the pre-facelift model. The tail lamps have also been carried forward. The Aspire facelift also gets a new set of multi-spoke alloy wheels. These new alloys are 15 inches in size, bigger than the 14-inch ones on offer on the pre-facelift model. They are wrapped in 195/55 cross-section tyre, like the Freestyle. The 14-inch tyres are wrapped in 175/65 section tyres like the pre-facelift model. Like the pre-facelift model, the facelifted Aspire carries forward the dual-tone black-beige interior theme. The 2018 Aspire misses out on leatherette upholstery, which was a part of the features list of the pre-facelift top-spec Aspire. The 2018 Aspire facelift now makes do with fabric upholstery. Unlike its predecessor, the new Aspire gets dual front airbags, ABS with EBD and rear parking sensors as standard across the range. The pre-facelift model offered only dual front airbags as standard. ABS with EBD was available as optional from the base Ambiente variant, while rear parking sensors were not available with the base variant at all. The new Aspire also comes with side curtain airbags in the Titanium+ variant and gets electronic stability control, traction control and hill launch assist in the Titanium AT variant, just like its predecessor. Lighting: The new Aspire gets auto headlamps, unlike its predecessor. Even in the top-spec variant, the pre-facelift Aspire was available with a 2-din music system with Bluetooth and voice activation control only. The facelifted Aspire, on the other hand, gets a touchscreen infotainment system in all variants except for Ambiente and Trend. While the Ambiente misses out on any kind of music system, the Trend gets a basic 2-din unit. The Trend+ and Titanium variants are available with a 7-inch touchscreen infotainment system with navigation. The top-spec Titanium+ gets the Freestyle’s 6.5-inch touchscreen infotainment system which supports Apple CarPlay, Android Auto, Emergency assistance and SYNC3. Other features offered on the new Aspire are quite similar to those of the pre-facelift model including auto climate control, tilt-adjustable steering, electrically adjustable and foldable ORVMs with turn indicators, height-adjustable driver seat, adjustable front and rear headrest and rear centre armrest. The new Aspire gets push-button start, rain-sensing wipers and a reverse parking camera over its predecessor. The Aspire facelift gets the new 1.2-litre 96PS/120Nm petrol engine that produces 8PS/8Nm more than the 1.2-litre motor of the pre-facelift model. The engine is mated to a 5-speed MT and has a claimed mileage of 20.04kmpl. The diesel engine, however, has been carried forward. The 1.5-litre diesel engine produces 100PS/215Nm with a 5-speed MT and has a claimed mileage of 26.1kmpl. Automatic variants get the 1.5-litre 123PS/145Nm petrol engine from the Ford EcoSport that makes 11PS/9Nm more than the older 1.5-litre petrol engine. This engine is now mated to a 6-speed AT (torque converter), whereas the older unit was mated to a 6-speed DCT (dual-clutch transmission). Variants: Unlike its predecessor, which was available in four variants only, the new Aspire is offered in five: Ambiente, Trend, Trend+ (new), Titanium and Titanium+. Price: The new Aspire undercuts its predecessor in terms of pricing, making it a stronger value for money proposition than before.